There’s no denying that cinemagraphs are beautiful, but beauty alone – as the old proverb goes – will not boil the pot. Fortunately “living photos” aren’t just easy on the eye, they’re also extremely versatile. Here’s how they can help you reach your marketing goals. Catching a customer’s eye is just the first step towards building a long-running relationship. As a savvy marketer, you know how crucial it is for that first connection to make sense in terms of your larger marketing strategy. You also know that jumping on every marketing bandwagon is a waste of time and money, because trendy gimmicks tend to burn out quickly and fade into the ether. Therefore, making the most of your marketing spend means investing in solutions that are as versatile and timeless as they are effective. Cinemagraphs can engage a wide array of audiences across all demographics regardless of how you choose to address them. Here are a few ways to make them work for your business. Omnipresent social media is the best way to speak to modern audiences. However, as every business now knows this, customers are bombarded by brands vying for their precious attention. So, what will make an idle scroller on Facebook, Twitter or Instagram stop and take notice? To set yourself apart from the crowd, you need to offer something truly relevant and meaningful that triggers an emotional connection. Cinemagraphs have been shown to generate those genuine reactions and are 60% – 80% more likely to be clicked than a static photograph. We introduced people on the street in Berlin to cinemagraphs at the start of 2017, prompting one participant to call them a “definite like on Instagram“. Gallereplay clients like booking.com and WWF are successfully using our cinemagraphs on social media to connect with their customers. Why not give them a try, too? No matter how big or small your company, don’t overestimate the importance of first impressions. You have a matter of seconds to capture the attention of a visitor to your site before they click away to something else. Cinemagraphs add a subtle yet engaging elegance to websites, and have been shown to double user dwell times as they keep visitors looking for longer. Understandably, many businesses shy away from embedding video or graphics into their homepages because they fear losing customers to long load times. Cinemagraphs don’t cause any loading lag and won’t make your customers leave before you’ve had the chance to impress them. Amongst the companies already using gallereplay cinemagraphs to add something special to their sites are the likes of American Express, TUI, and Switzerland’s Sunrise Mobile. Imagine for a second an ad that actually enhances the beauty of the web page. We’re so used to brash, gaudy advertising that something subtle and enticing seems like a pipe dream. But companies like German newspaper Bild and Tesco have successfully changed tack and now use cinemagraphs in their display ads. They know all too well that even for household names, it takes a lot to encourage a click. Ads need to be thoughtful and visually arresting to stop someone turning on AdBlock. As mentioned above, people are far more likely to click on a cinemagraph than a still image and that applies to ads too. Movement naturally triggers our attention and by combining it with an artistic image, we zone in on what exactly is happening. How many times have you sat through a boring business presentation, or worse, been speaking in front of a bland Powerpoint with a growing awareness that you’re losing the crowd? Most presentations rely on humdrum graphs and bullet points (and maybe a star-wipe slide transition if you’re lucky). Once you’ve taken in the key information, there’s not much left to focus the eye. The key to a great presentation is in being memorable, and offering your audience something visually interesting to look at will play a huge part in that. Cinemagraphs are simple to integrate into Keynote and Powerpoint presentations and the movement will make your presentation look elegant, retain the crowd’s attention, and will keep them talking about what you had to say once you’ve stepped away from the screen. 5. Capture Attention Offline, Too! Cinemagraphs can also help to generate real-world buzz for those who need to engage their customers in the physical world first. They look great on video walls or any physical screen whether you’re at a trade show, advertising in a shopping mall, or trying to attract crowds to your stand at a conference. Take the opportunity to show that your business is state-of-the-art, while creating an ambience that fits the occasion. Billboard advertising doesn’t have to be boring either, and let’s be honest, if you spice things up, you’ll be doing a favour to all those people waiting in airport terminals or passing the time on their commute. Lufthansa is amongst the forward-thinking companies to have recognized this and will be displaying a gallereplay cinemagraph on a video wall in their brand new Lufthansa Lounge in Boston. 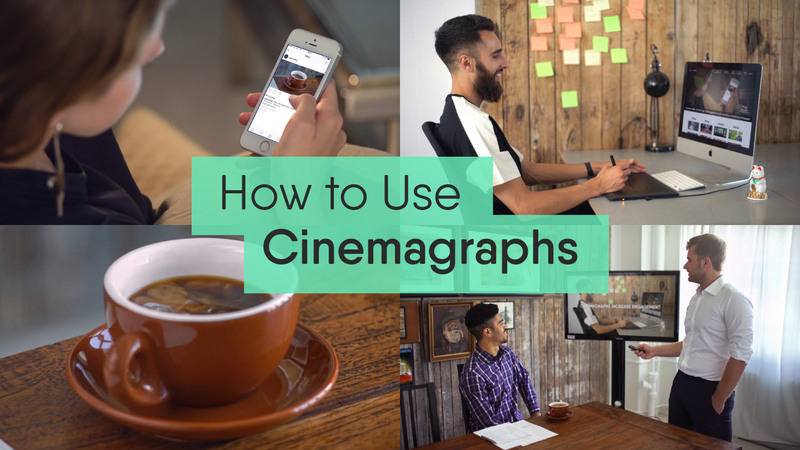 From piquing initial interest to providing a pleasant user experience, cinemagraphs can be used to support goals across all stages of your marketing strategy. Regardless of the size of your company, whether it’s well-established or brand new, or how you choose to speak to your customers, cinemagraphs are guaranteed to make you memorable. Ready to give cinemagraphs a try? Browse our collection! Also check out our step-by-step guides for posting cinemagraphs to social media and using cinemagraphs in Powerpoint and Keynote presentations.